94% of respondents of a survey said they would not return to a business if the washroom was dirty or was perceived to be dirty – this included odours! Read more about it here. Smells in the workplace can be very off-putting for staff and any visitors. A strong hygiene regime is essential for creating a healthy and clean atmosphere. Waste levels must also be kept under strict control and units like sanitary bins – which are prone to bacteria, should be regularly cleaned and emptied. Find out more about our sanitary bin services here. Ozone Washroom Air Cleaner is a unique air cleansing system which destroys any harmful micro-organisms upon contact. It also has the capability to break down odour-causing compounds. By installing our Ozone unit, the bacterial growth which lives on surfaces, including door handles, locks, tap controls, sinks and surrounding surfaces – will be reduced. Ozone eliminates unpleasant smells and creates a pleasant outdoor-fresh environment in even the hardest areas to keep clean. 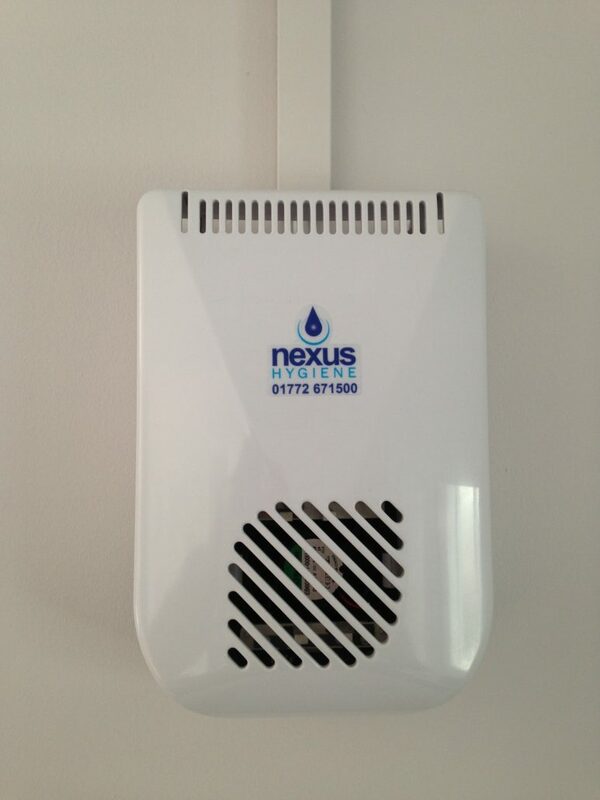 The Ozone unit is installed and maintained by Nexus Hygiene Ltd and is recommended for areas with severe odour problems. Contact us today to arrange a site survey for free advice on how an Ozone Washroom Air Cleaner could benefit your washroom.